The dissemination of research findings is a critical component of the knowledge translation (KT) process and is frequently thought to occur somewhere between the generation and synthesis of knowledge. When is knowledge ready for dissemination? Decisions about the extent and scope of KT plans should be guided by the reliability, validity, strength, and significance of research findings. The general advice is not to place excessive emphasis on the results of single small studies, studies of poor methodological quality, or ones where the strength of evidence is low. The research findings should also be of major significance to knowledge users before extraordinary means of dissemination are employed. Lomas provides a useful taxonomy of KT activities that groups them into three conceptually distinct types: diffusion, dissemination, and implementation. Diffusion – efforts that are passive and largely unplanned, uncontrolled and primarily horizontal or mediated by peers. In this category of KT activities, the onus is on the potential adopter to be able to formulate a question that they may have, know how and where to search for the relevant knowledge that may answer their question, access knowledge when they identify it, critically appraise it and then apply it to their issue or problem. Dissemination – focuses primarily on communicating research results by targeting and tailoring the findings and the message to a particular target audience. What are the fundamentals of end of project KT/dissemination? Goals – identifying the KT goals in order to select the dissemination strategies that are most likely to achieve the goals. Expertise – considering what expertise is required to execute the KT plan. What is known about effective dissemination strategies? The Rx for Change Database contains synopses of reviews of the effectiveness of KT strategies directed at professionals and consumers (e.g., patients and organizations). There is also the EPOC taxonomy of interventions for effective dissemination strategies. Grimshaw and colleagues recently revealed that there is: a) considerable evidence of the effectiveness of dissemination strategies directed at professionals, although many areas remain under explored; b) considerably less evidence about how to influence consumers’ uptake of research knowledge; and c) little evidence about effective strategies to influence the use of research by policy makers and senior health service managers. What is an integrated KT approach to dissemination? In integrated KT, stakeholders or potential research knowledge users are engaged in the entire research process. By doing integrated KT, researchers and research users work together to shape the research process by collaborating to determine the research questions, deciding on the methodology, being involved in data collection and tools development, interpreting the findings, and helping disseminate the research results. There may be considerable value in engaging knowledge users (e.g., patients, clinicians, policy makers, and managers) in developing and executing KT plans because they can a) help to craft the research messages so that they are in a language and format that is suitable for the intended audience; b) offer insight into who might be credible messengers; c) suggest potentially useful KT strategies that may be attractive to their colleagues; and d) even have existing communication channels to reach the intended audience. 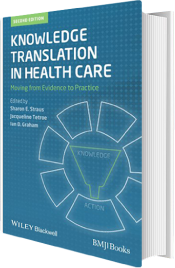 *For more information on knowledge dissemination, please refer to the full publication “Knowledge Translation in Health Care: Moving from Evidence into Practice” (2013).